Colony of Diplosoma listerianum (L) is a "drab" green-grey that has a smooth gelatinous surface by touch. Tiny small openings represent a single zooid. The large openings are common excurrent channels. Diving photo credit: Rokus Groeneveld, Diverosa. Structural details can be seen by microscopy. 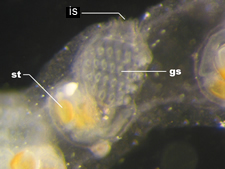 Primary zooid (L) and zooid-pair (R) of Diplosoma listerianum after metamorphosis. is, incurrent siphon, gs, gill slits (stigmata), st, stomach. The tunic, siphons, and branchial sac are translucent. The digestive tract is yellow-orange. 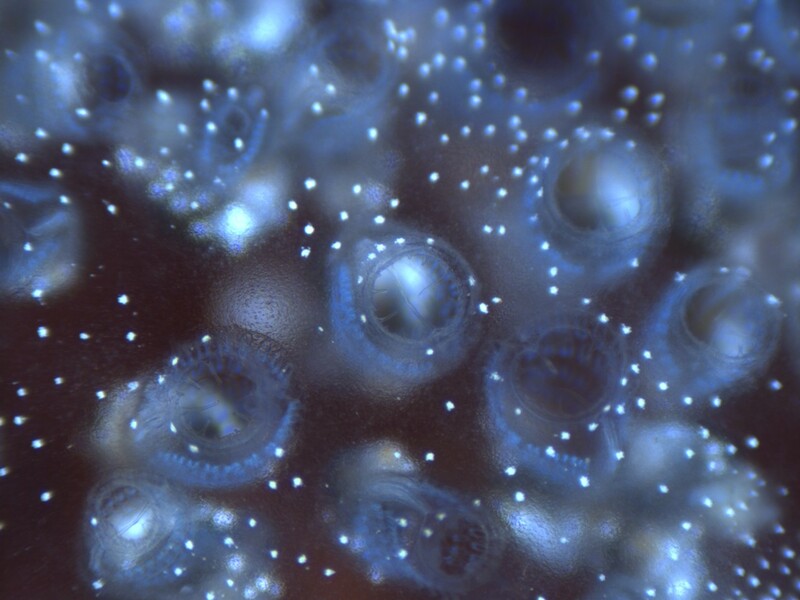 Upper micrograph, Kristenberg Marine Genomics, M Thornedyke. 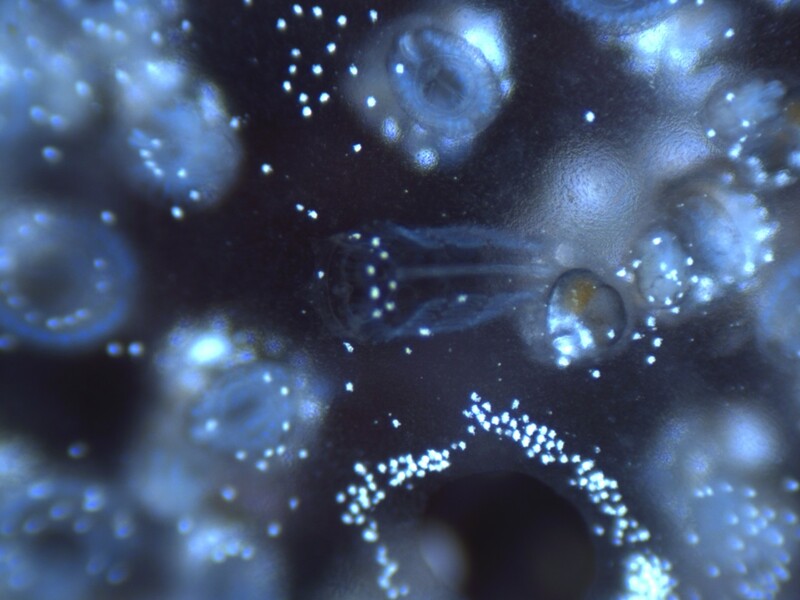 Lower, 群体海鞘（Diplosoma listerianum）幼体, Blue Animal Bio. 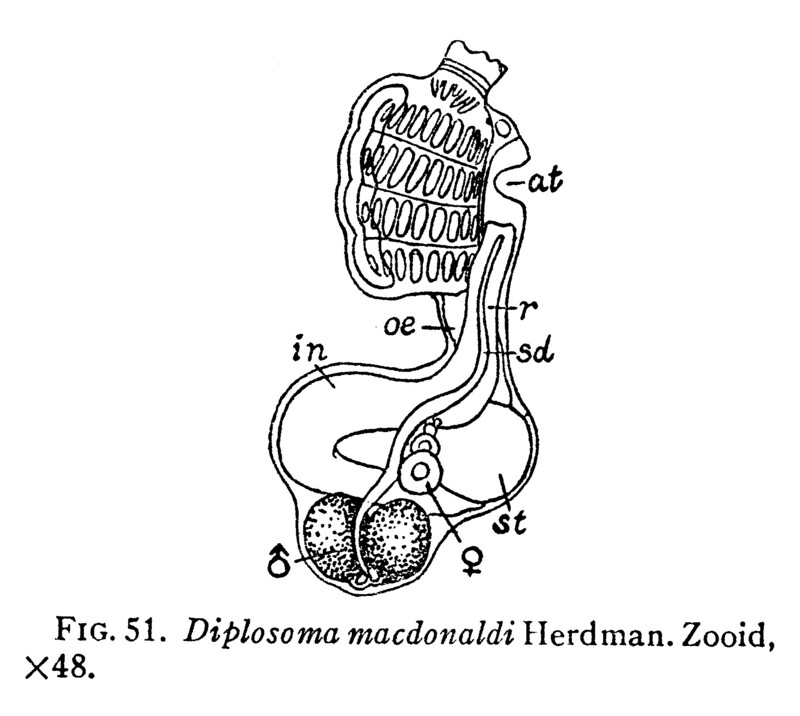 Diplosoma macdonaldi, from W.G. Van Name, North and South American Ascidians, 1945. 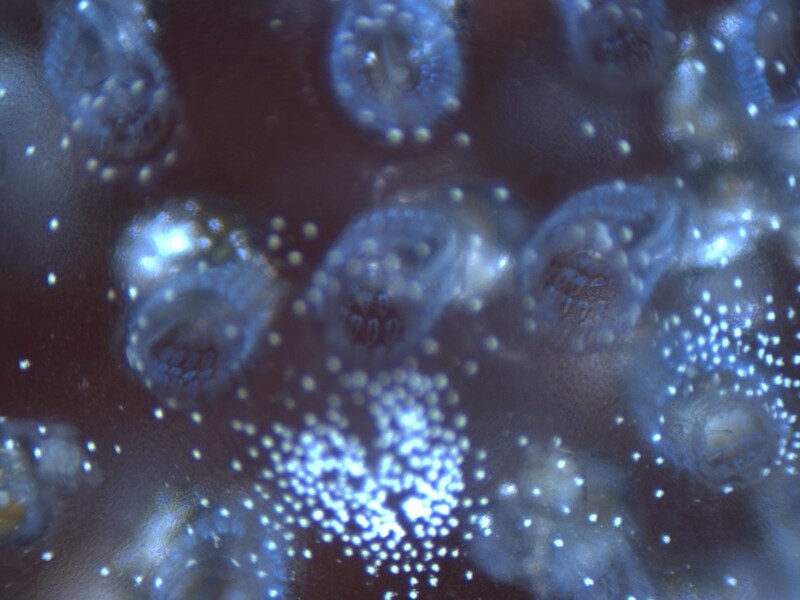 Diplosoma listerian growing on red alga glows light blue by fiber-optic stereomicrosocpy. 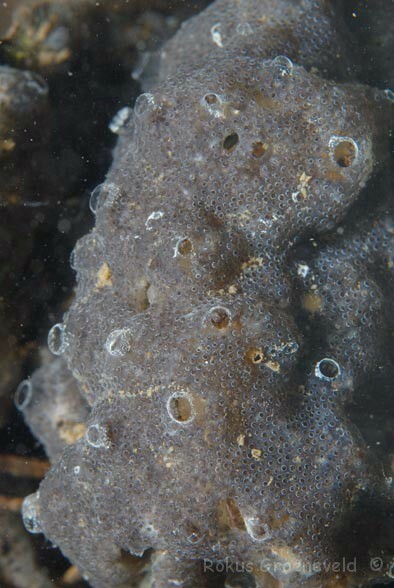 This view is from above, looking almost directly down on the branchial siphone, which have 6 lobes and up to 24 thin branchial tentacles or variable size. The branchial sac bears 4 rows of stigmata, which can be clearly seen through the opened branchial siphone arranged in a ring around the opening. 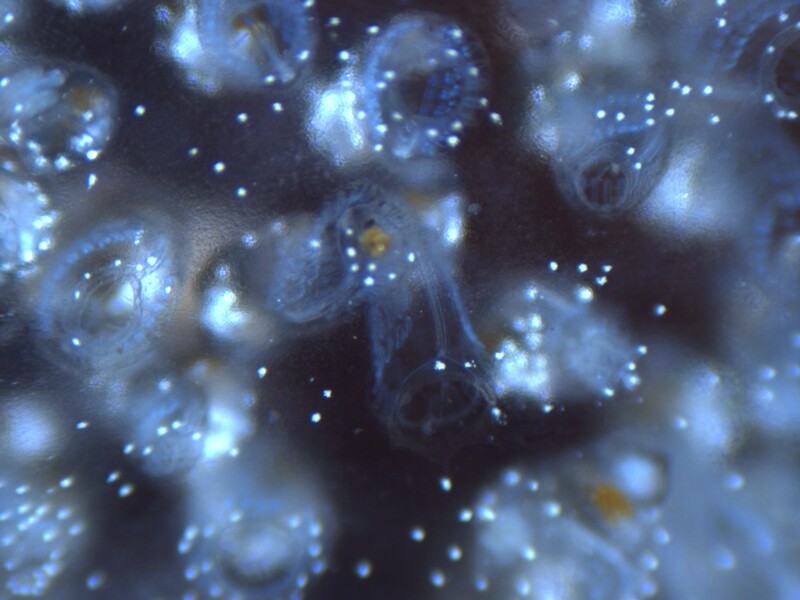 Diplosoma listerianum zooids showing rows of light blue stigmata. This view is looking at a slight angle through the branchial opening stowing some stigmata from the side. The upper rows of stigmata are in clear focus. The digestive tract, ovary, and testis are located deeper in the colony below the plane of focus. Diplosoma listerianum zooids showing one zooid slight from the side showing the endostyle rrunning down one side of the branchial basket through a break in the rows of stgmata. Orange colored areas represent internal organs in the zooid abdomen. Diplosoma listerianum zooids showing another zooid slight from the side and the much larger common excurrent siphon encircled by a dense ring of white pigmented cells.